The statues brought ashore by the fishermen. 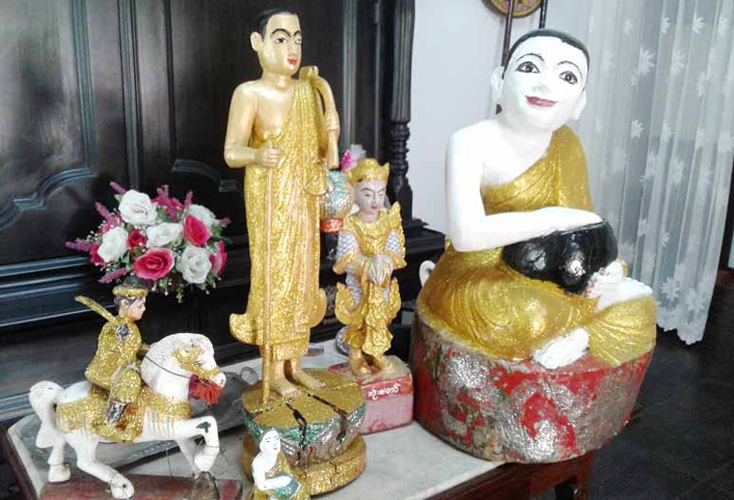 Several colourful Buddha statues, including other sculptures, which were reportedly on a canoe floating in the sea about 250 nautical miles away from Trincomalee, were spotted and brought ashore by a group of fishermen from Galle. The fishermen had been on a multi-day fishing mission onboard the trawler ‘Veenavee 1’ which left the Galle Fishery Harbour about a month ago. The fishermen, who took the figures onboard their trawler, despatched them to Magalle Kachchiwatte Ancient Temple in Galle and subsequently deposited there. Among the floating figurines were three statues of Arhat Seevali, a figure of a deity, and a brightly decked out princess mounted on horseback, all 7 in number. Seevali is an Arhat widely venerated among Theravada Buddhists. He is respected as the Arhat of travel and is believed to ward off misfortunes at homes such as fire or theft. Magalle Kachchiwatte Ancient Temple Chief Incumbent Ven. Uluwitike Bodhiseeha Thera on examining the statues said the figures might have been sent from Myanmar as there is a religious festival there in which Arhat Seevali is honoured with rituals and the figures are kept on open boats and floated in the sea.